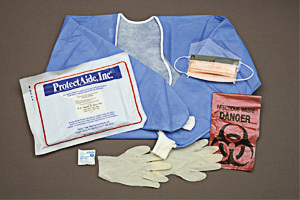 For aid in the prevention of cross-contamination from blood-borne disease. Contains full length gown, one pair of latex gloves, Fluidshield Mask w/Splashguard Visor, antimicrobial wipes and biohazard waste bag. The Protectaide Deluxe Personal Protection Kit provides head-to-toe personal protection, kit contains all items listed above plus head cover and shoe covers.